The Araripe Basin (Portuguese: Bacia do Araripe) is a rift basin covering about 8,000 square kilometres (3,100 sq mi), in Ceará, Piauí and Pernambuco states of northeastern Brazil. It is bounded by the Patos and Pernambuco lineaments, and is situated east of the Parnaíba Basin, southwest of the Rio do Peixe Basin and northwest of the Tucano and Jatobá Basins. The basin has provided a variety of unique fossils in the Crato and Santana Formations and includes the Araripe Geopark, a member of the UNESCO Global Geoparks since 2006. The pterosaurs Araripesaurus and Araripedactylus (now considered a nomen dubium), crocodylian Araripesuchus, the turtle Araripemys, amphibian Arariphrynus, the fish Araripelepidotes and the insect Araripenymphes were named after the basin. The bituminous shales of the Ipubi Formation in the Araripe Basin have potential for shale gas development. 4) Post-Rift I phase - Aptian to Albian - characterized by thermal subsidence. The lowermost unit Barbalha Formation, represents a fluviolacustrine phase and is composed of red and gray shales, siltstones and claystones. ^ Bianca Carvalho Vieira; André Salgado; Leonardo Santos. 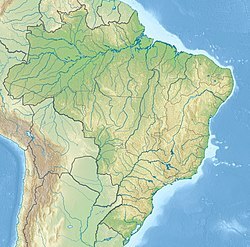 Landscapes and Landforms of Brazil. p. 232. Assine, Mario L. 1992. Análise estratigráfica da Bacia do Araripe, Nordeste do Brasil. Revista Brasileira de Geociências 22. 289–300. Accessed 2018-08-21. Bétard, François; Jean-Pierre Peulvast; Alexsandra de Oliveira Magalhães; Maria de Lourdes Carvalho Neta, and Francisco Idalecio de Freitas. 2017. Araripe Basin: A Major Geodiversity Hotspot in Brazil. Geoheritage _. 1–18. Accessed 2018-08-21. Fabin, Carlos E.; Osvaldo J. Correia Filho; Márcio L. Alencar; José A. Barbosa; Tiago S. de Miranda; Virgínio H. Neumann; Igor F. Gomes, and Felipe R. de Santana. 2018. Stratigraphic Relations of the Ipubi Formation: Siliciclastic-Evaporitic Succession of the Araripe Basin. Anais da Academia Brasileira de Ciências 90. 2049–2071. Accessed 2018-10-05. Neto, João Adauto; Haydon Mort; Ricardo Pereira; José Barbosa; Virginio Neumann; Walter Vortisch; Osvaldo J. C. Filho; Paulo de A. L. S. Brandão, and José G. A. Pacheco. 2013. Carbonaceous Shales in the Araripe Basin, NE Brazil: A Potential Shale Gas Reservoir, 1–7. AAPG Annual Convention and Exhibition. Accessed 2018-08-21. Ribeiro Oliveira, Gustavo; Antônio Álamo Feitosa Saraiva; Helder de Paula Silva; José Artur Ferreira Gomes de Andrade, and Alexander Wilhelm Armin Kellner. 2011. First turtle from the Ipubi Formation (Early Cretaceous), Santana Group, Araripe Basin, Brazil. Revista Brasileira da Paleontologia 14. 61–66. Accessed 2018-08-21. Scherer, C.M.d.S. ; E.F. Jardim de Sá; V.C. Córdoba; D.d.C. Sousa; M.M. Aquino, and F.M.C. Cardoso. 2013. Tectono-Stratigraphic evolution of the upper Jurassic-Neocomian rift succession, Araripe Basin, Northeast Brazil. Journal of South American Geosciences _. 1–43. Accessed 2018-08-21. Aparecida dos Reis Polck, Márcia; Marise Sardenberg Salgado de Carvalho; Raphael Miguel, and Valéria Gallo. 2015. Guia de identificação de peixes fósseis das Formações Crato e Santana da Bacia do Araripe, 1-74. Serviço Geológico do Brasil (CPRM). Báez, A.M.; G.J.B. Moura, and R.O. Gómez. 2009. Anurans from the Lower Cretaceous Crato Formation of northeastern Brazil: implications for the early divergence of neobatrachians. Cretaceous Research 30. 829–846. Accessed 2018-10-06. Bechly, G., and V. N. Makarkin. 2016. A new gigantic lacewing species (Insecta: Neuroptera) from the Lower Cretaceous of Brazil confirms the occurrence of Kalligrammatidae in the Americas. Cretaceous Research 58. 135–140. Accessed 2018-10-06. Cavalcanti Duque, Rudah Ruano, and Alcina Magnólia Franca Barreto. 2018. Novos Sítios Fossilíferos da Formação Romualdo, Cretáceo Inferior, Bacia do Araripe, Exu, Pernambuco, Nordeste do Brasil - New Fossiliferous Sites of the Romualdo Formation, Lower Cretaceous, Araripe Basin, Exu, Pernambuco, Northeast of Brazil. Anuário do Instituto de Geociências, UFRJ 41. 5–14. Accessed 2018-10-06. Elgin, Ross A., and Eberhard Frey. 2011. A new ornithocheirid, Barbosania gracilirostris gen. et sp. nov. (Pterosauria, Pterodactyloidea) from the Santana Formation (Cretaceous) of NE Brazil. Swiss Journal of Palaeontology 130. 259. Accessed 2018-10-06. Fara, Emmanuel; Antônio Á.F. Saraiva; Díogenes de Almeida Campos; João K.R. Moreira; Daniele de Carvalho Siebra, and Alexander W.A. Kellner. 2005. Controlled excavations in the Romualdo Member of the Santana Formation (Early Cretaceous, Araripe Basin, northeastern Brazil): stratigraphic, palaeoenvironmental and palaeoecological implications. Palaeogeography, Palaeoclimatology, Palaeoecology 218. 145–160. Accessed 2018-10-06. Figueiredo, R.G., and A.W.A. Kellner. 2009. A new crocodylomorph specimen from the Araripe Basin (Crato Member, Santana Formation), northeastern Brazil. Paläontologische Zeitschrift 83. 323–331. Accessed 2018-10-06. Jorge de Lima, Flaviana; Antonio Álamo Feitosa Saraiva, and Juliana Manso Sayão. 2012. Revisão da paleoflora das Formações Missão Velha, Crato e Romualdo, Bacia do Araripe, nordeste do Brasil. Estudos Geológicos 22. 99–115. Leite da Silva, Agnelo, and Virginio Enrique Neumann. 2003. Formação Crato da Bacia do Araripe: um reservatório análogo ao Calcário Trairí (Formação Paracuru), Bacia do Ceará, 1–6. 2o Congresso Brasileiro de P&D em Petróleo & Gás. Accessed 2018-10-06. Makarkin, V.N., and F. Menon. 2007. First record of fossil 'rapismatid-like' Ithonidae (Insecta, Neuroptera) from the Lower Cretaceous Crato Formation of Brazil. Cretaceous Research 28. 743–753. Accessed 2018-10-06. Martill, D.M. 2007. The age of the Cretaceous Santana Formation fossil Konservat Lagerstätte of north-east Brazil: a historical review and an appraisal of the biochronostratigraphic utility of its palaeobiota. Cretaceous Research 28. 895–920. Accessed 2018-10-06. Myskowiak, J.; D. Huang; D. Azar; C. Cai; R. Garrouste, and A. Nel. 2016. New lacewings (Insecta, Neuroptera, Osmylidae, Nymphidae) from the Lower Cretaceous Burmese amber and Crato Formation in Brazil. Cretaceous Research 59. 214–227. Accessed 2018-10-06. Neumann, V.H. ; A.G. Borrego; L. Cabrera, and R. Dino. 2003. Organic matter composition and distribution through the Aptian–Albian lacustrine sequences of the Araripe Basin, northeastern Brazil. International Journal of Coal Geology 54. 21–40. Accessed 2018-10-05. Pinheiro, Allysson P.; Antônio Á.F. Saraiva, and William Santana. 2014. Shrimps from the Santana Group (Cretaceous: Albian): new species (Crustacea: Decapoda: Dendrobranchiata) and new record (Crustacea: Decapoda: Caridea). Anais da Academia Brasileira de Ciências _. 1–8. Accessed 2018-10-06. Prado, Gustavo M.E.M. ; Guilherme Raffaelli Romero, and Luiz Eduardo Anelli. 2016. New occurrences of fossilized feathers: systematics, taphonomy, and paleoecology of the Santana Formation of the Araripe Basin (Cretaceous), NE, Brazil. PeerJ _. 1–49. Accessed 2018-10-06. Salisbury, S.W. ; E. Frey; D.M. Martill, and M.C. Buchy. 2003. A new crocodilian from the Lower Cretaceous Crato Formation of north-eastern Brazil. Palaeontographica. Abteilung A, Palaozoologie - Stratigraphie 270. 3–47. Accessed 2018-10-06. Scherer, C.M.d.S. ; E.F. Jardim de Sá; V.C. Córdoba; D.d.C. Sousa; M.M. Aquino, and F.M.C. Cardoso. 2013. Tectono-Stratigraphic evolution of the upper Jurassic-Neocomian rift succession, Araripe Basin, Northeast Brazil. Journal of South American Geosciences _. 1–43. Accessed 2018-10-05. • Souza Lima, Wagner, and Gilvan Pio Hamsi Junior. 2003. Bacias sedimentares brasileiras. Phoenix 49. 1. Accessed 2017-09-04.